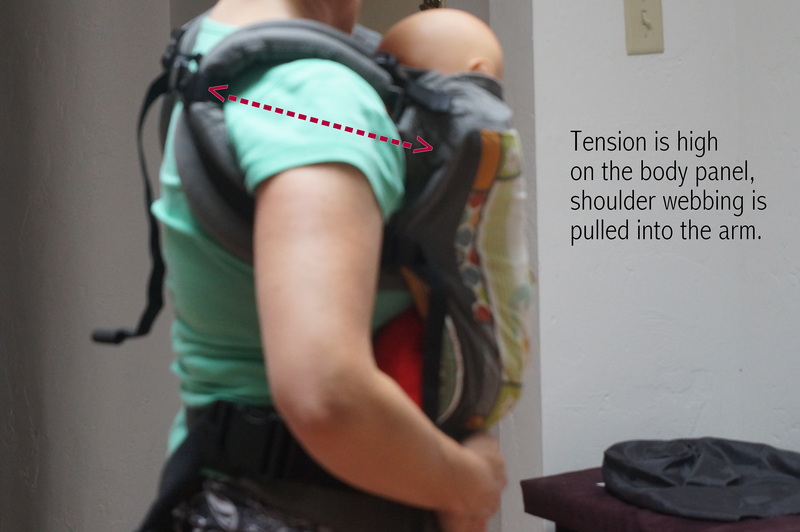 The carrier pulls at the back of the neck. When the clip is worn high on the neck, it tightens the carrier primarily around the top seam of the body panel. 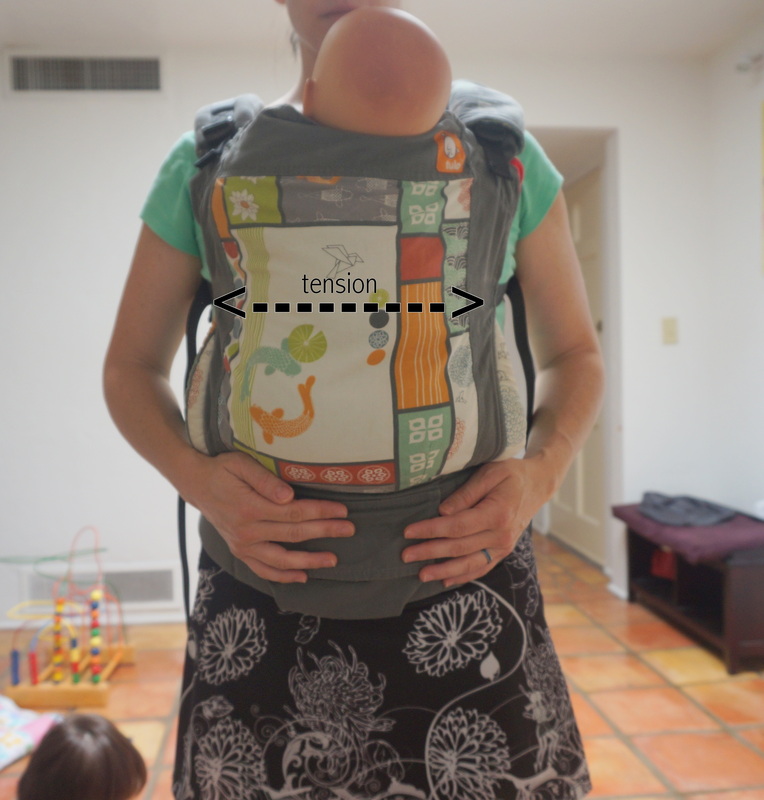 In wrapping terms, this is similar to having too tight a top rail in a ring sling carry. (Safety note: The baby in the photos below is not a real child but a demo doll sitting on an infant insert pillow. An infant the size of this doll is much to small for this carrier. They would need to be in a full infant insert with the face visible at all times to be worn safely.) 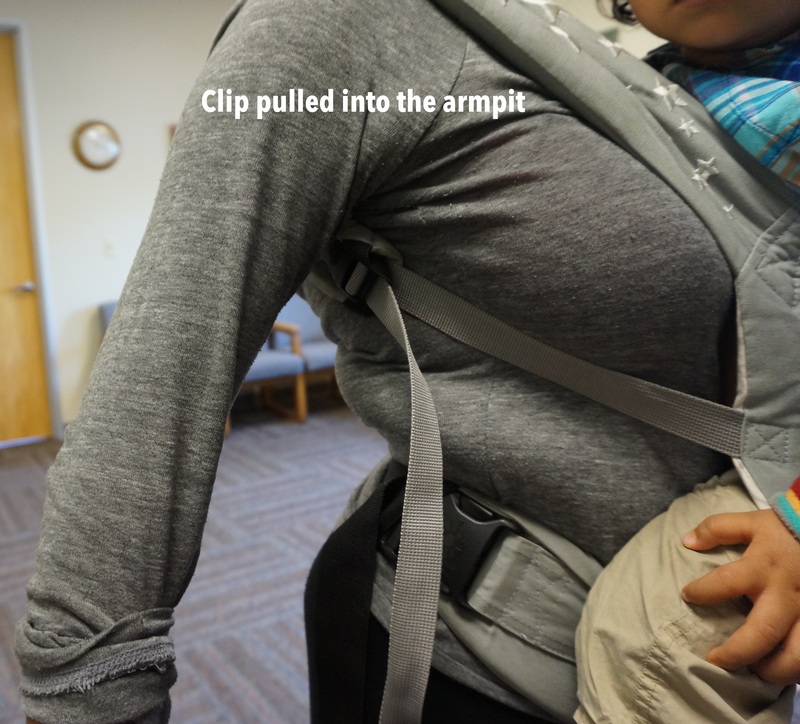 This both puts added pressure on the wearer’s neck and pulls the child’s head firmly into the wearer’s body. Baby is squished, wearer is uncomfortable, and no one is happy. 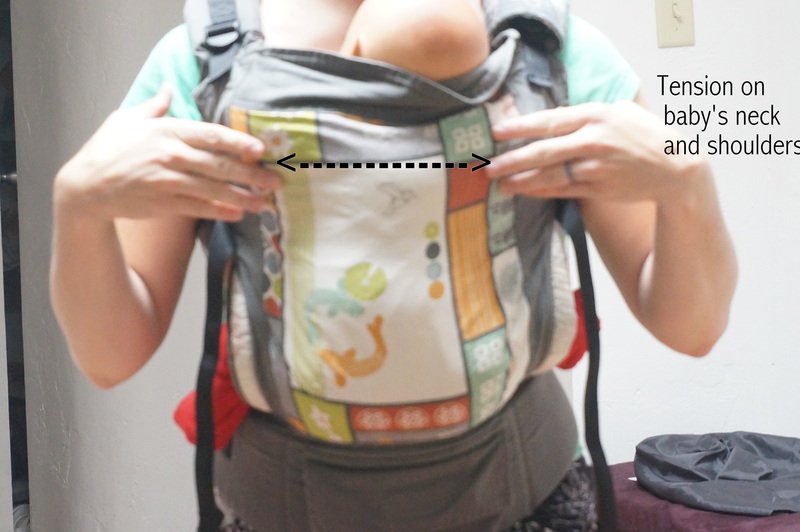 More importantly, because the pressure is on the top seam of the body panel, it is unable to apply even pressure around the body of the carrier and will not provide back support to the child as when properly placed. When the clip is lowered, it distributes the tension around the middle of the body panel. 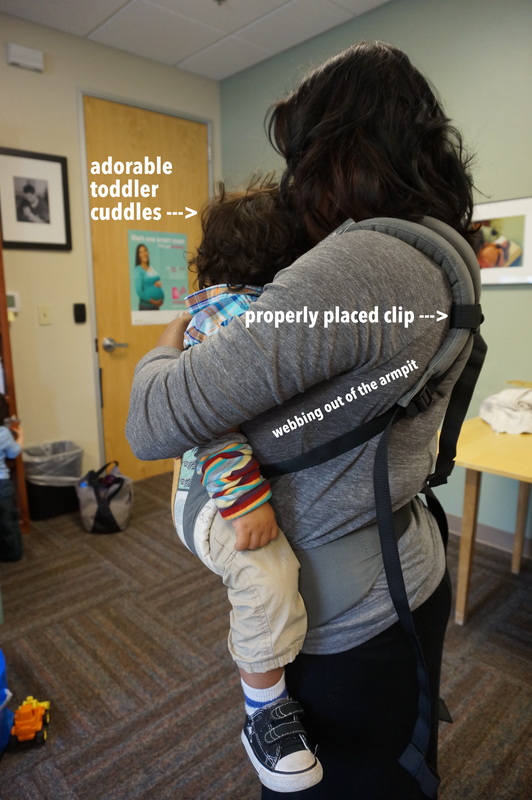 This provides better support for the child’s spin and takes the pressure off both the child’s and wearer’s neck. 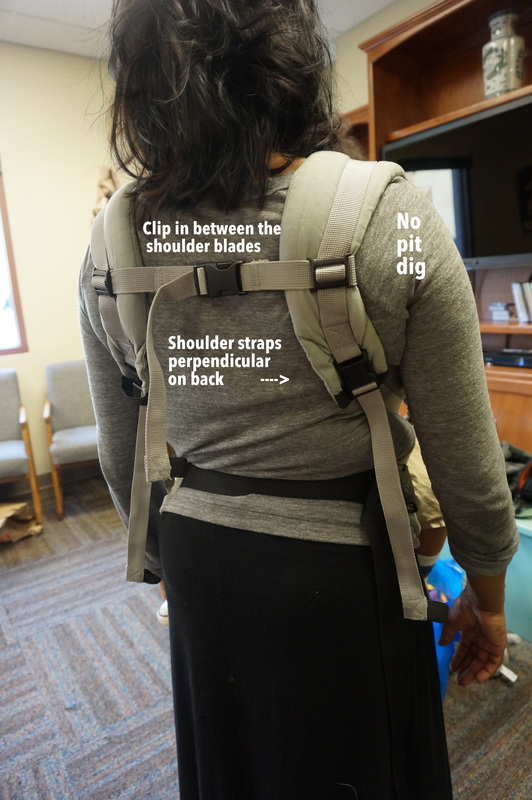 Comparing the two photos, you can also see how lowering the chest clip pulls the shoulder strap webbing lower on the body and out from under the armpits. Problem: How the heck do I reach the darn thing to clip it? I’m not a yogini! Solution: Loosen your shoulder straps. 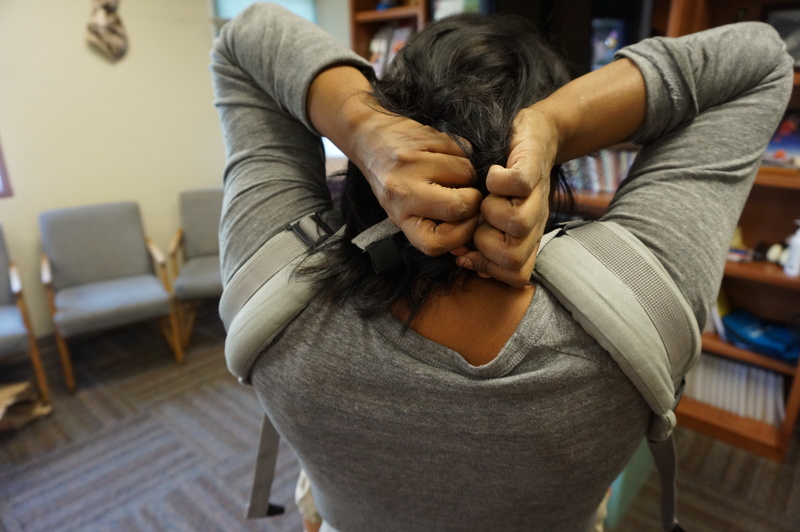 You should be loosening and readjusting your shoulder straps each time you take the carrier on and off. By loosening them, you put slack into the straps allowing you to reach the clip easily. 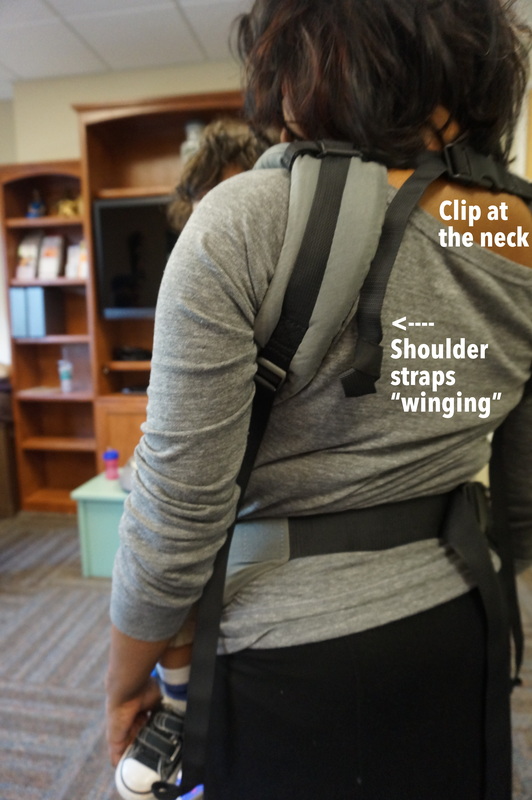 When properly positioned, the shoulder straps should be somewhat perpendicular (up and down, not at an angle) and rest on the wearer’s back. Readjusting the shoulder straps each time will ensure that you get a precise, and comfortable, fit. 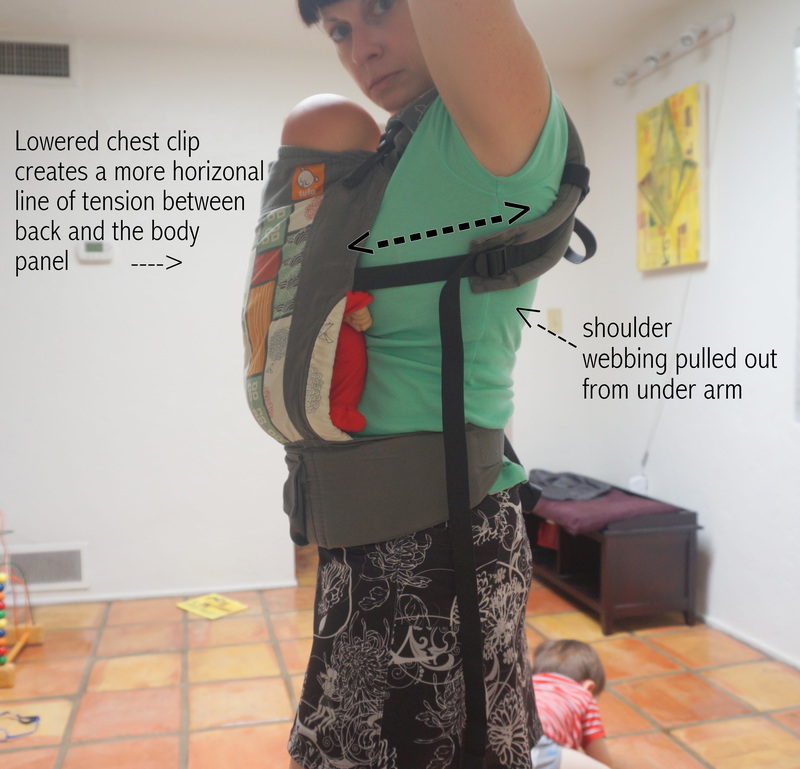 In addition to making babywearing more comfortable for the wearer, the chest clip is an important adjustment for the baby as well.